Ciwidey is a small town in southern Bandung. It is the gateway to the beautiful highland on the slope of mount Patuha. 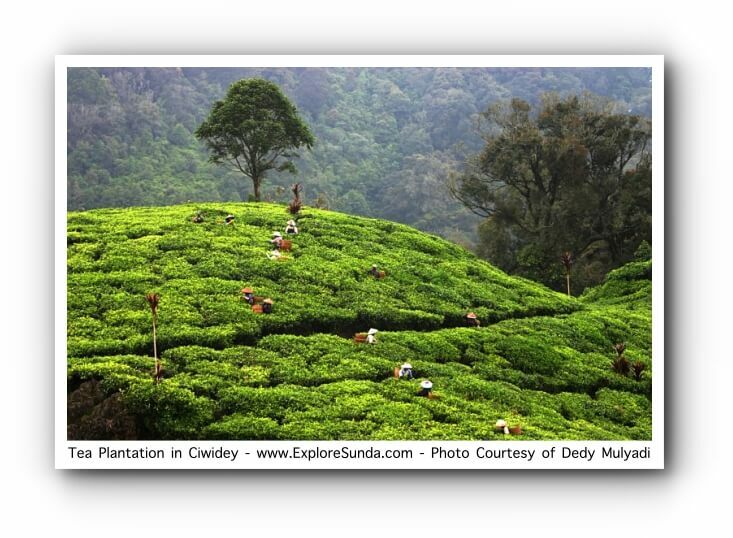 We, at the ExploreSunda.com, still believe that they are the must visit places. On top of that, there are newer fun activities too, since this area has developed into an attractive tourist destinations. For example, we can self picking strawberries in the many strawberry farms, walk around and enjoy the beautiful scenery of tea plantations or we can just relax and treat ourselves in the resorts. So, let's start our adventure! Kawah Putih, or White Crater in English, is one of Sunda's hidden gem. It is a beautiful volcanic lake, located approximately 47 km south of Bandung. The view of the crater is amazing: from the mix of white and greenish color of the lake, the white sandy beach, to the limestone cliffs. Even some trees can grow in this crater. Continuing our journey, we will pass tea plantation and at the end of the road we will arrive at Situ (lake) Patenggang, which also known as Situ Patengan. It is a favorite family vacations destination in Sunda, due to its beautiful scenery. Tea plantation that looks like a green carpet covering the hills, surrounded this lake. Together with the pine forest and the greenish lake they form a very beautiful and relaxing view. This new resort combines glamping and dining while enjoying the relaxing view of Situ Patenggang and Rancabali tea plantation that surrounds it. It is located right on top of the legendary Batu Cinta. Originally Ranca Upas was a forest with a big swamp, that's how it got its name: Ranca is a sundanese word for swamp and Upas is a species of flora that was often found in this area. Then the area is used for breeding Javan Rusa a.k.a. Sunda Sambar (Rusa timorensis), a species of deer native to the islands of Java, Bali, and Timor. The brochure mentioned that the breeding area is 5 ha. However, we only saw 20 deer inside the fence during our visit to Ranca Upas. So I'm not certain whether the 5 ha is divided between the breeding area, camping and play ground or the 20 deer in a fence is the only ones for display, while others roaming freely in the woods. Anyway, since their habitat is so muddy, we'd better stay in the wooden platform. They are tame enough since they are used to visitors feeding them carrots. 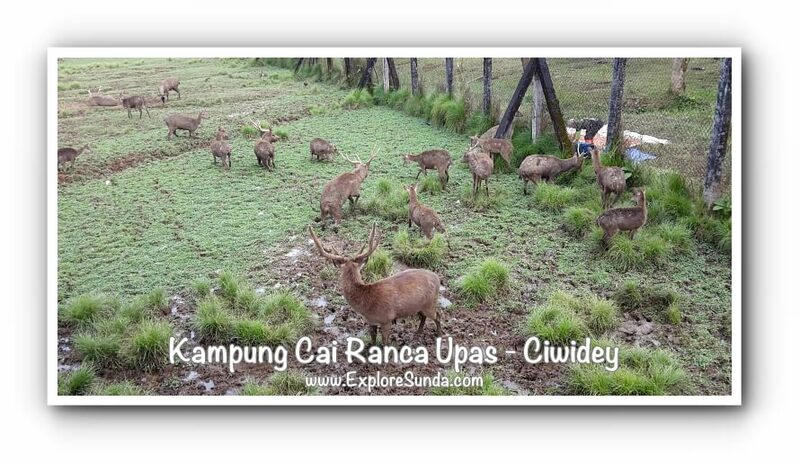 In addition to the deer breeding, Ranca Upas has camping grounds and water park. We even can rent the camping gear. Then we can play all day long in the water park. 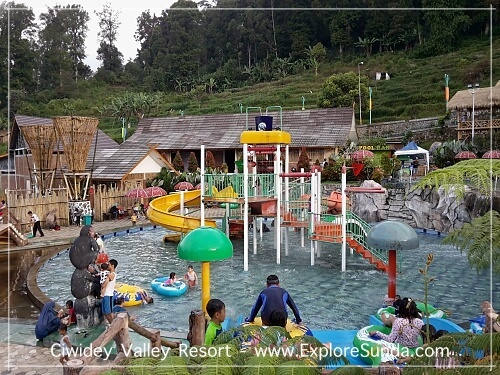 Although it is rather cold in Ciwidey, the brochure mentioned the water used for the water park is warm, since it comes from the nearby hot spring. 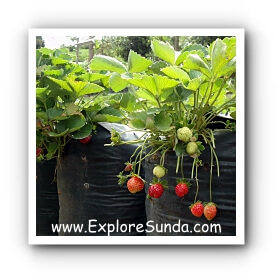 The cool weather in the slope of mount Patuha is perfect for strawberry farms. Hence, there are many strawberry farms here, but they are all will be crowded during weekend and holidays. So, you'd better come early. The farmer will give you a basket and you can pick the strawberry by yourself. The price is more expensive than buying them in the store, but strawberry picking is always fun, especially for children. 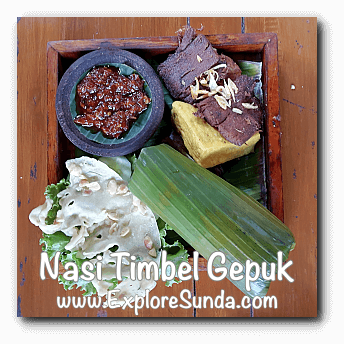 There are several traditional snacks you can only find in Ciwidey. First snack is sweets made of orange skin. It is called 'kalua jeruk'. Next snack is 'berondong jagung' (pop corn ball). It is pop corn glued together with palm sugar. Since there are many strawberry farms in this area, we also can buy stawberry sweets called dodol strawberry, made of sticky rice, sugar and strawberry juice. Several years ago, the only recommended restaurant and hotel in this area was only Sindang Reret. But today, there are so many options we can choose: spend a night in the villas, hotels and motels, guest houses and inns. There are at least two resorts here. 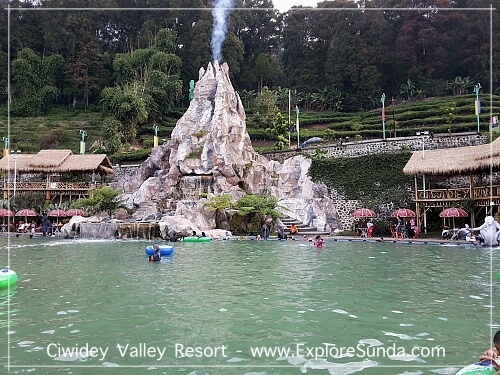 One of them is Ciwidey Valley Resort. It is very easy to reach because the location is on the side of the main road and close to Kawah Putih. It has a small water park with warm water from the nearby hot spring and a playground with a small labyrinth. We can choose to stay in the 2 story hotel or in tents. They are not normal size camping tents, the size of each tent is similar to a hotel room. Another resort is eMTe Highland Resort. Its location is right in front of the Kawah Putih's entrance. 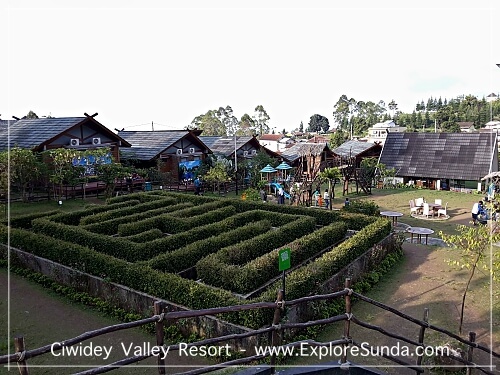 In addition to the hotel and restaurant, this resort offers outdoor activities such as flying fox, pedal boat, horse ride, atv ride, strawberry farm and fishing pond. Although Sindang Reret hotel looks outdated compared with the newer hotels and resorts, the sundanese food here is still recommended. One of their specialty is 'Gepuk'. Gepuk is sliced beef, spiced, and then cooked for hours until tender. The taste is rather sweet. If you like spicy food, you can try sundanese salad named karedok. Karedok consists of raw vegetables such as cucumber, string beans, eggplant and cabbage with oncom sauce. Oncom is made of beans fermented with fungi, which you can only find in Sunda. If you prefer cooked vegetables, you can order gado-gado, which comprises cooked cabbage, string bean, bean sprouts, boiled egg and potato, fried tofu and tempe with peanut sauce. This highland is approximately 50 km southwest Bandung. The easiest way to go there is via toll road. The good news is there is a new toll road opened in 2018. It is called Soroja, a shortened name of Soreang - Pasirkoja. So, if you enter the toll road from Padalarang, Pasteur, and Cimahi, you should choose direction to Cileunyi and go to the direction of Pasirkoja and Soreang. If you come from other access, such as Cileunyi, Buahbatu, and Moh. Toha, then you should choose direction to Padalarang and exit at Pasirkoja and Soreang. The exit is a bit confusing for the first-timer, because as soon as you direct your car to the exit, you must choose direction to Soreang straightaway. Nevertheless, this toll road helps to reduce the time travel to Ciwidey, since it bypass the traffic jam between Kopo and Soreang. One last tip before you go to Ciwidey, Kawah Putih and Situ Patenggang: don’t forget to bring your jacket, since the cold wind makes it quite freezing up there. Ciwidey in the south, Lembang in the north, and Garut in the east, it is absolutely worth it to explore the Bandung highland. Which one is your favorite?